Skanking is a form of dance usually associated with ska, punk, reggae, and other alternative music scenes. It originated in the 1950s or 1960s in the dance halls of Jamaica, where ska and reggae music was often played. Skanking consists of a “running man” motion of the legs to the beat while alternating bent-elbow fist-punches, left and right. In recent years, ska music has become the prominent backbeat for skanking, and is the genre most closely associated with it because of groups like The Mighty Mighty Bosstones, Big D & The Kids Table, and Reel Big Fish. In fact, because of the dance’s known connection to ska, Reel Big Fish released a song titled “Don’t Stop Skankin” in 2012. This track is off their eighth studio album, Candy Coated Fury, and is all about the love affair between skank and ska. A wide variety of chucks skank on this hardwood floor. The song is actually a straight up instrumental, with no lyrics other than the phrases “Pick It Up” and “Don’t Stop Skankin” that are sung on the choruses. This lack of singing actually fits really well with the overall point of the track, which is to be a beat that you can easily skank to. The song has very bouncy beat because of the horns, which really adds to the skank-ability of it. About a minute and a half into the song, there is an absolutely excellent trumpet solo by John Christianson that really stands out. Everybody joins the skank line. The music video begins with the band performing “somewhere in Riverside” at a venue called Cow Town USA. The band plays their song in front of a sold out crowd. It appears to be some sort of Halloween party, as everyone is dressed in weird but fun costumes. There’s a giant witch, a spooky ghost, and Frankenstein’s Monster, and they’re all skanking. There are also little vignettes that feature the “monsters” interacting with the other people at the party. 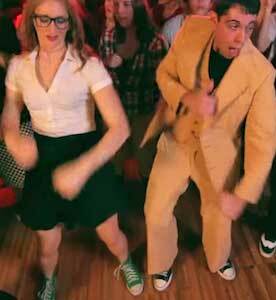 Skanking ska fans wear an assortment of high and low top chucks in this video in a wide variety of colors. 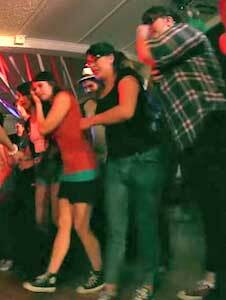 The video ends with the whole party forming a skanking line, and pairs of partygoers skank down the middle. The barn they’re in then explodes because of the explosive alien egg that just happened to be sitting at the snack table. It’s a quirky video that’s perfect for the song, as there is absolutely no shortage of goofy skanking here. Click on the links below to get a new pair of chucks to go skanking.